Are you interested to try out a human capital management tool for your business? 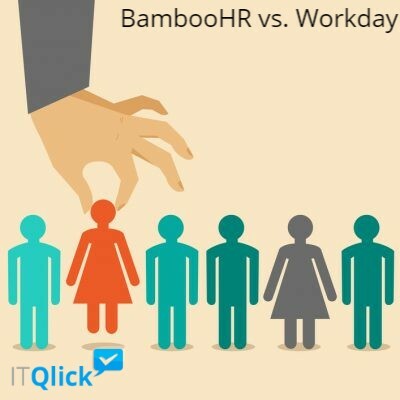 Well, there are two solutions that top the list of HCM tools – BambooHR vs Workday. But which one is the best solution for your enterprise to manage human resources without any hassle? Let us take you through the two systems and compare against each other to see which of the two should be the right fit for your business. BambooHR comes with a simple, clean, and easy-to-use interface that makes navigation easier. The tool is very intuitive and enables you to jump in and use hassle free. On top of it, the platform requires zero training and is a breeze to implement, which means you do not need to be a software engineer or IT expert to use BambooHR. Contrarily, Workday HCM requires constant support in the initial stages. Despite having a clean interface, it takes time to get a hang of the system. In the event you cannot afford to hire technical staff, using the software in the early stages, including implementation, may create a lot of frustration. BambooHR is ideal for smaller companies requiring a SaaS HRMS due to its flexibility. The tool is scalable, which means it grows with the expansion of your business. Even large companies looking for a tool for the efficient management of workflow can find BambooHR handy. Typically, BambooHR works efficiently for a global business due to its differentiation capabilities between locations for reporting and on-boarding. On the other hand, WorkdayHCM allows for a lot of flexibility as far as customizing and automating processes are concerned. But you need an experienced technical team for constant maintenance. Nevertheless, the system works like a breeze and you can start using its capabilities with support of your technical team. Workday HCM is an ideal human capital management tool for companies looking for ways to capitalize on employee and manager self-service. As far as larger companies are concerned, WorkdayHCM offers additional space and tools to process the application. It runs like a well-oiled machine, with reports running in the background without users having to wait for them. BambooHR is available in two packages, including Essentials and Advantage. Price may vary based on the number of additional features required. Users can avail discounts for prepayment. Not-for-profit discounts are available with BambooHR. Contact Workday for a quote on its SMB and enterprise pricing. Additionally, users rate Workday higher than BambookHR in terms of average discount percentage. It offers a longer average length of contract compared to BambooHR. However, users find WorkdayHCM as one of the most expensive tools in the niche. Users rate BambooHR higher for its integration capabilities with third-party apps, delivering high functionality and improving productivity. It integrates with employee engagement apps, payroll, benefits management, Applicant Tracking Systems, Enterprise Resource Planning, and e-signatures. Designed with the object model in mind, the Workday API enables reliable, auditable integration to keep your business running efficiently. As a result, ongoing audits are less complex and cost effective. Workday’s HCM Suite covers numerous applications that merge various capabilities, including recruiting, talent management, benefits, and human resources, into a single platform. Its integration suite enables an enterprise to connect to different SaaS apps. BambooHR is fairly easy to use and implement. It works best as an employee directory so users can check details other employees without any hassle and easily reach out to them. Contrarily, some WorkdayHCM features are tough to find and use. The system is not very user-friendly. BambooHR takes out the hassle in storing piles of data, and the information about each employee is centralized and a click away. This ensures that you have the correct documents available every time. The human capital management solution makes it easy to change and update data. On top of it, it’s reporting capability is excellent, ensuring you are always on top of things. With WorkdayHCM reporting and analytics capabilities, it’s easier than ever to get a complete view of your employee data and work history. You can create compelling stories with data through the reporting and analytics feature, besides uncovering opportunities, identifying risks, and monitoring trends. BambooHR offers a powerful HR mobile app for Android with an in-built company directory, so you can stay in touch with team wherever you go. Workday offers mobile apps for both iOS and Android. This helps users in the efficient management of workforce database and recruiting process irrespective of location. Workday also features social media integration, which makes it easier for users to import applicant details from various sources. You can expect friendly, responsive, and timely customer service with BambooHR. However, WorkdayHCM gets an edge over its prompt responsiveness and 24/7 customer service. Workday rates higher for average number of users compared to BambooHR. While BambooHR is easier to use, WorkdayHCM comes with some level of technicalities for new users. The lack of user guides makes it even tougher for a new user to navigate through the system. Additionally, the latter is said to be more expensive than BambooHR, which makes it a right fit for large companies. BambooHR is good for human resources (HR) and administrative functions, but it is not as efficient a system for recruiters as WorkdayHCM. So each system has its pros and cons. Choose the one that suits your organizational goals. If you are still having trouble choosing the right fit for your enterprise, let ITQlick team guide your choice.